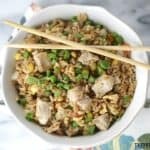 Need a quick 30-minute meal idea? Why not try these Grilled Pork Tacos With Corn & Mango Salsa! This is a sponsored post. Opinions are 100% my own. It’s no secret the 30-minute meals are my best friend. It doesn’t get much better than preparing a hearty family meal in 30 minutes. Dinner time is family time in our house so the less time I spend preparing the meal, the better. In my continuing quest to have dinner on the table in 30 or less, I created these Grilled Pork Tacos With Corn and Mango Salsa. What I love about my 30-minute meal mission is combining flavors to create one delicious meal that my family will love. The key to creating quick and flavorful meals is the ingredients that are used. For this recipe, I grilled the Smithfield® Garlic Herb Filet variety. Since the pork is already marinated, the preparation time is cut down significantly. Smithfield® Marinated Pork offers “Real Flavor Real Fast.” It’s the perfect solution for a delicious 30-minute meal. All that I needed to do is grill the pork according to package directions. Smithfield® Marinated Fresh Pork is available in a variety of flavors across Tenderloins, Loin Filets and Roast. Tacos are always an easy meal option. I usually make beef or chicken tacos for dinner but I thought I would change it up a bit a grill a Smithfield® Garlic Herb Filet this time. There is nothing more delicious than the seared flavor of grilled pork. The fact that the mess is contained outside on my grill and not in the kitchen is another bonus! Assembling these Grilled Pork Tacos is a no-brainer. I first grilled the Smithfield® Garlic Herb Filet according to the package directions. When the pork reached the perfect internal temperature, I removed from the grill and allowed it to rest for about 15 minutes. I then chopped the pork into bite-sized cubes so I can start filling the taco shells. But wait! There’s more! While the pork was resting, I made this super simple Corn & Mango Salsa by combining corn, mango, jalapeno, onion lime and cilantro. It is a delicious alternative to a tomato-based salsa. I assembled the tacos with the pork, salsa, lettuce, cheese, and onion. The fun thing about tacos is that you can garnish them any way you like. I usually set all the toppings out and let my family add the garnishes they like. This helps satisfy the picky eaters in the family. It’s meals like these Grilled Pork Tacos With Corn and Mango Salsa that make dinner quick and easy! 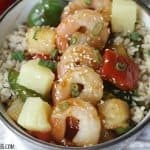 Need a quick 30-minute meal idea? Try these Grilled Pork Tacos With Corn & Mango Salsa! They are perfect for taco night! Grill marinated pork filet on a medium high grill, according to package directions. When the pork reaches the correct internal temperature, remove and let rest for 10 minutes. 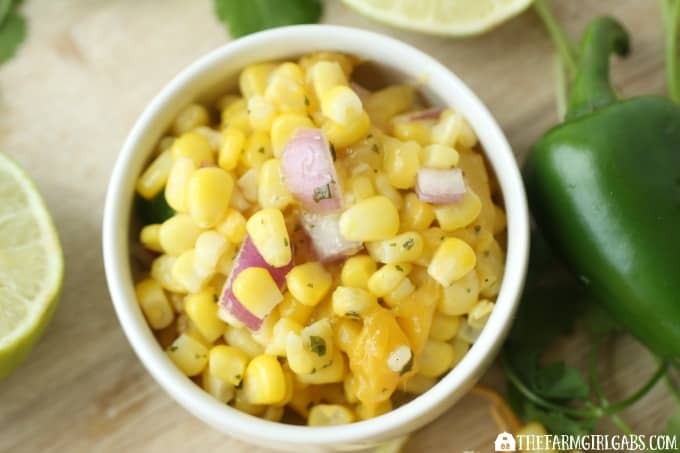 While pork is grilling, add corn, diced mango, red onion, jalapeno and garlic to a medium bowl. Mix together. Add the juice of one lime, oil and salt. Mix and set aside until ready to use. Once pork is rested, cut into small cubes. Assemble the tacos by adding a few tablespoons of pork and garnish with salsa and other optional garnishes. Hi Melissa, This looks so yummy. Feel free to drop by and share it at the weekly party. A new one starts every Friday. These tacos look amazing! I’m always looking fro ways to change them up! Thanks for the yummy recipe! Stopping by to let you know you are being featured on Friday’s P3 Party post! Have a great week! Thanks for pinning!